Everyone knows there was a gold rush in California in 1849. Less appreciated, however, is the fact that the rush was not always as intense as we might think, and followed a slow-fast-slow rhythm, not only because of the processes needed to get to the gold, but also because the rush was greatly affected by the methods of communication available at the time, which were enormously different from those of today. 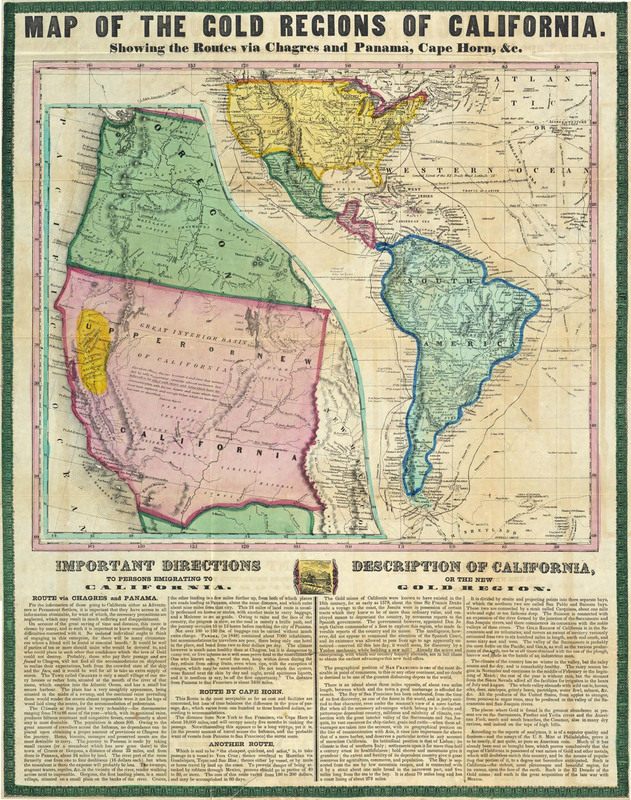 In February 1848, as one of the results of victory in the U.S.-Mexican War, California came under American control. The region at that time was sparsely settled, inhabited by Native Americans, Mexican farmers and ranchers, and some 3,000 Americans, widely dispersed across the region, who in some cases had entered illegally during the years of Mexican rule, and in other cases had been welcomed by Mexico to help develop the economy. The first English language newspaper in California, the Californian, was published in 1846 in Monterey by Walter Colton, the chaplain of the U.S. frigate Constitution, who chose to settle in California and who had been editor of the Philadelphia North American. To the north, in the settlement of Yerba Buena (the future San Francisco), the state’s second paper, the California Star, appeared in1847. Its publisher was Samuel Brannan, who had previously been the proprietor of two Mormon papers, The Prophet and the New York Messenger. Almost immediately, Brannan and Colton began a competition for readers and carried on a war of insults with each other in the pages of their publications. But, even though the two were competitors, both Brannan and Colton were like most other western newspaper publishers of the era in that they did not go out of their way to print information about interesting local events. They assumed that news in this category would travel by word of mouth well before they could print it, and they did not have the financial means to hire reporters who could look for information by going to the scene. The general passivity in gathering local news was one reason why the Californian and the California Star were slow in reporting the discovery of gold at John Sutter’s Mill on the American River in January 1848. Another reason was skepticism on the part of most Californians. 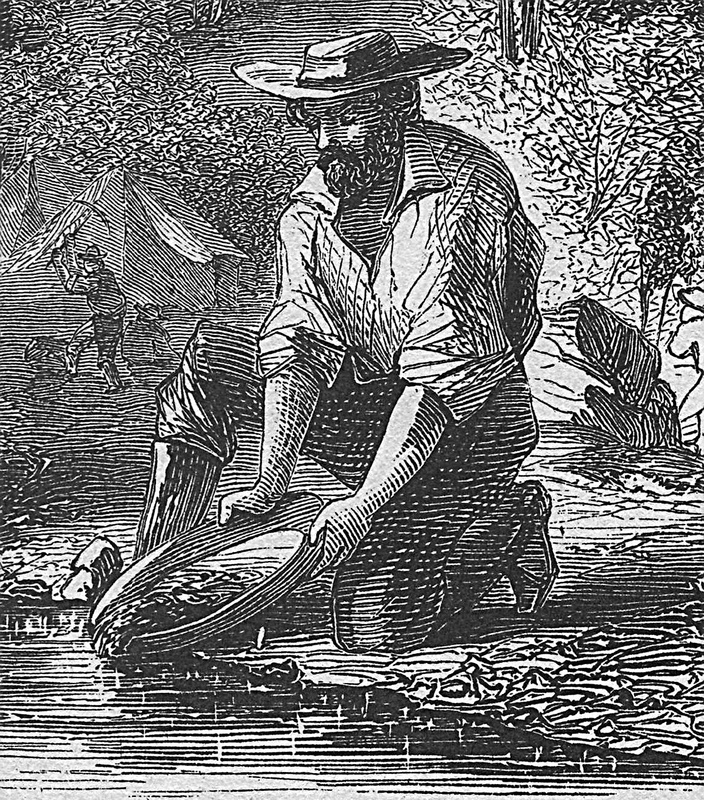 Although Sutter’s workers and others who lived near his property could see with their own eyes that gold was present, and although most of Sutter’s employees soon abandoned him to search for treasure, Californians were used to hearing rumors about gold discoveries, and remembered how a gold find near Los Angeles in 1842 came to almost nothing because the deposit was much less extensive than at first assumed. 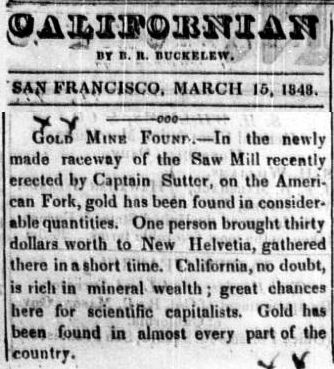 The Californian did not print any news about the discovery at Sutter’s Mill until March 15, 1848, when it offered the terse headline “Gold Mine Found,” followed by a short, matter of fact report by a local correspondent. But then, as information traveled by word of mouth, on April 1, 1848, the California Star came out with an extra edition and sent 2,000 copies to Missouri hoping to sell papers and attract people to California to develop the economy. Brannan was curious enough to travel to Coloma and there saw the gold with his own eyes. He returned to San Francisco on May 12 and, displaying a bottle of gold dust, shouted to passersby “Gold! Gold! Gold from the American River!” On May 29 the Californian published a highly enthusiastic article about the discovery. Mania soon spread throughout California and all along the Pacific coast, attracting miners from as far away as Peru, Hawaii and Canada. News of the gold discovery reached the east more slowly. Word of mouth played a role, as did personal letters that made their way east from California overland or in most cases by ship. 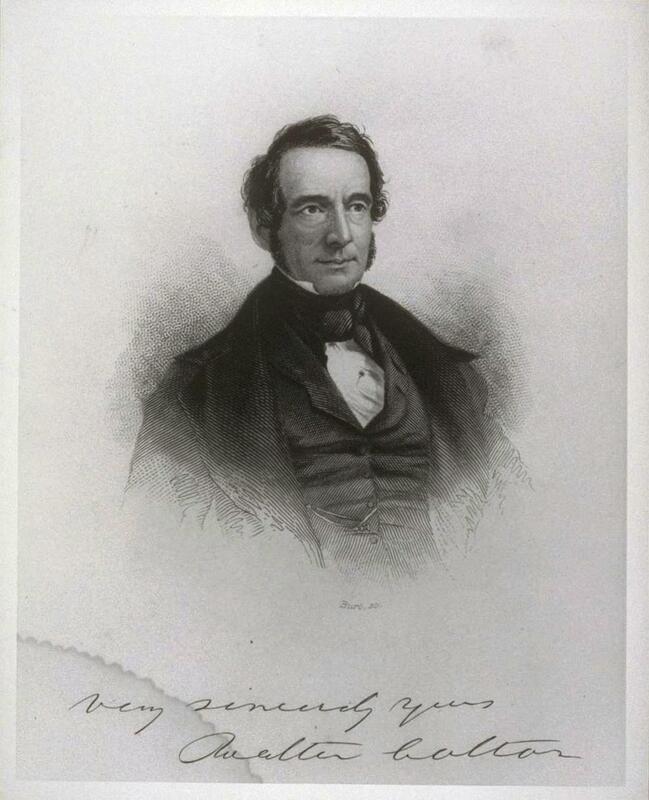 A prominent Monterey businessman, Thomas Larkin, wrote long letters on June 1 and June 28 and July 20, 1848, to Secretary of State James Buchanan in Washington DC, alerting him to the national importance of the gold discoveries. Larkin’s first letter, of June 1, was carried across Mexico and reached Washington DC in mid-September 1848. 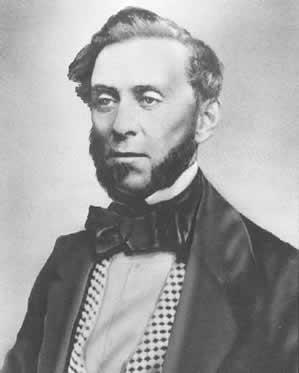 Colonel Richard Mason, the military governor of California, visited the gold fields in June 1848 and, after becoming convinced that the discoveries were substantial, composed an enthusiastic eyewitness description. He sent his report, along with 230 ounces of gold, via special courier on a ship that left Monterey harbor on August 30 and arrived in Washington DC in late November 1848. 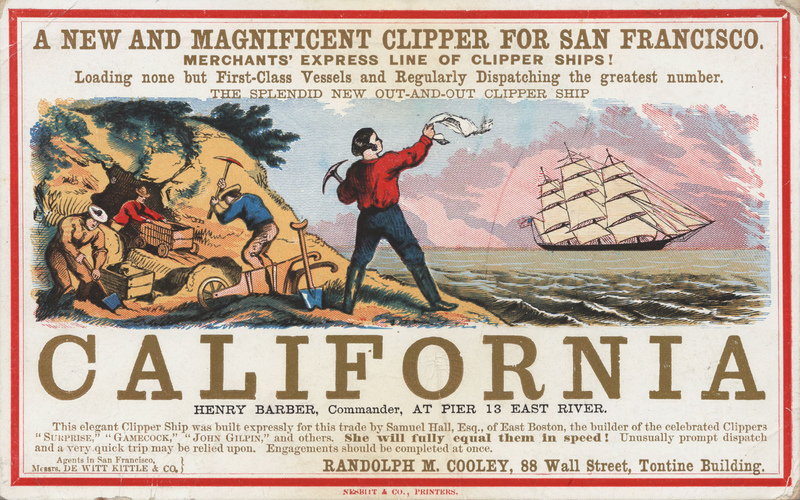 Newspapers in the east, in the United States, were slow to pick up the story of the gold discovery in California. Then, on August 8, a St. Louis newspaper published an excerpt of an article from the California Star, the April 1 issue of which had been brought overland from San Francisco, telling of extensive gold discoveries. On August 19 the New York Herald reprinted a letter from California containing an excited report of gold. Shortly thereafter the Baltimore Sun and the New Orleans Daily Picayune and the New York Journal of Commerce printed similar letters. On September 14 the Philadelphia North American published a dramatic letter from the mayor of Monterey. Publicity about the gold discoveries in California took a large step forward on December 5, 1848, when President James K. Polk addressed the second session of the 30th Congress. By that time he had received Colonel Mason’s report and had been persuaded by it. Eager to find reasons to justify the recently concluded war with Mexico, and to encourage settlement of the lands that had come into U.S. possession as a result, Polk officially added his enthusiasm to Mason’s report, and its details were soon being circulated in newspapers throughout the U.S. as part of the reports of the President’s speech. Quickly thereafter, colorful stories about the gold in California appeared in literally every newspaper in the United States, and the rush of the 49ers began. Even more powerful to eastern audiences than newspapers were the letters, published in small town newspapers, received from those California settlers who were the first to go to the gold fields. The letters had directness and personal credibility. After their first appearance they were republished again and again in other localities and in other states. One effect exerted by newspapers came through advertising. Eastern readers now saw a flood of advertisements from men who wanted to sell their possessions to get the funds needed to pay for the journey to California, along with ads from societies wishing to form groups for travel west via Panama or Cape Horn. There were ads for boots, clothing, medicines, and gold testing equipment. Inventors took out ads to announce the necessity of purchasing their odd gold finding devices. There were ads offering passage by ship to California; the 18,000-mile journey around Cape Horn took four to six months. There were also ads for the faster route via Panama, which took only several weeks. Travelers went by steamer from New York to the Isthmus of Panama, traversed thick jungle for three or four days, then connected with another line of steamers going north to California. This route was more expensive, more crowded on board ship because of the small number of steamers, and had the risk of disease often contracted in the jungle. For many easterners, the idea of travel by ship seemed frightening, especially to those who had never seen the seacoast. They were more comfortable with the idea of overland travel. There was already a history of travel west from Missouri via the Oregon or Santa Fe trails. The overland journey to California could be made in three months if all went well. Groups of easterners, usually about 50 each, organized themselves into business companies and raised capital for their ventures. Local newspapers assisted the process by printing announcements of the business opportunities, lists of members of the societies organized for travel, and the frequently detailed rules and regulations to be observed by members of an expedition. Overland travelers to California needed information about the challenges they would encounter. They could draw upon fragmentary knowledge of the west gained through oral tradition and any literary accounts they might have read. There were published factual accounts by earlier travelers to the west, the most famous being John C. Fremont’s Report of the Exploring Expedition to the Rocky Mountains in the Year 1842 and to Oregon and North California in the Years 1843-’44. By the spring of 1849, they could purchase the emigrant guides that were beginning to be published in book and pamphlet form. They could also gain information from the many articles that were now being published in newspapers, with advice on questions like what food and clothing to buy, whether oxen or mules should be used, and where they might encounter dangers along the way such as hostile Indians or difficult river crossings. Many newspaper articles included tables of distances between key points along the route. The United States Post Office Department was overwhelmed by the rapid growth in the population of California and the demands of overland travelers for delivery of their letters to friends and families in the east. The first special agent assigned to establish post offices in California arrived there in February 1849, with orders to set up offices in San Diego, San Pedro, Santa Barbara, Monterey and San Francisco. The steamships of the Pacific Mail had to cope with rapid increases in volume of letters. On October 31, 1849, more than 45,000 letters accumulated at the San Francisco post office, and the clerks had to construct barricades to protect themselves from the clamoring crowds. Long lines formed, with waiting times of up to six hours. Vendors turned profits by selling cakes, coffee and newspapers. In November 1849 a post office opened in Sacramento City. This created the problem of how to deliver letters to miners in the Sierra foothills. Sensing a business opportunity, some miners left their claims to offer private delivery services to shuttle letters and newspapers from the Post Office to miners in the camps. In the gold fields, receipt of a new issue of a newspaper was a major event. Those in the gold fields who read the descriptions of California provided in the eastern papers were troubled by the overall impression the publications gave, that everyone was becoming rich and a miner’s life was not harsh. 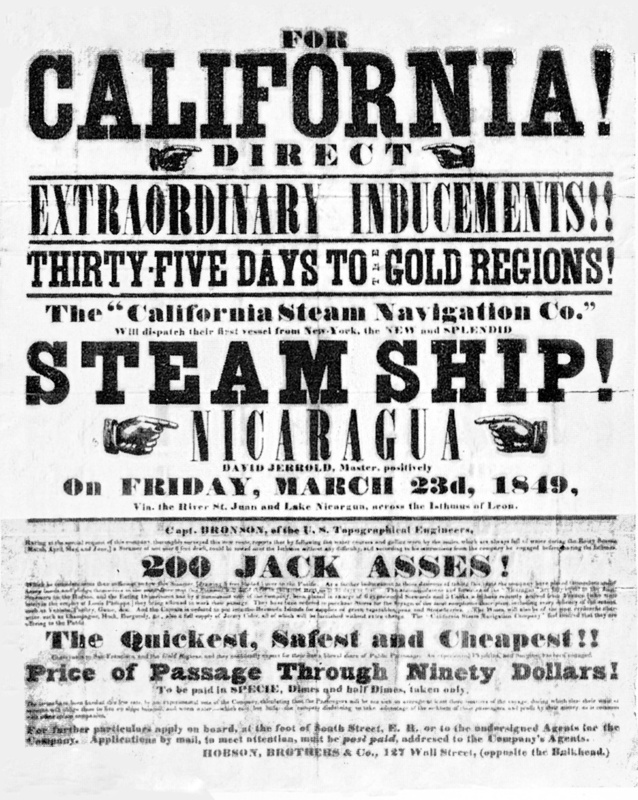 In contrast, the emphasis in California papers when they covered the rush for gold was upon order. They crusaded for better law enforcement and justice, reported in detail on the growth of business, noted and praised the appearance of institutions of civilization like schools and theaters and libraries and hospitals, and hailed the arrival of increasing numbers of women who intended to marry and raise families. 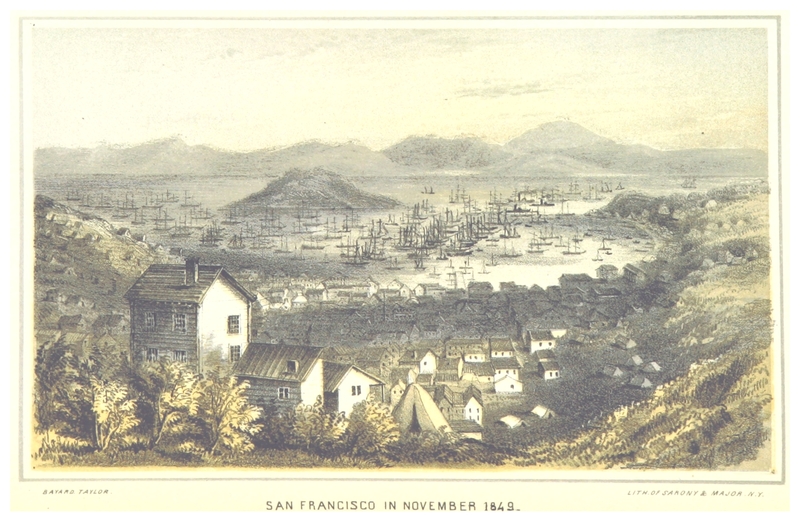 San Francisco in 1849, still a small village. 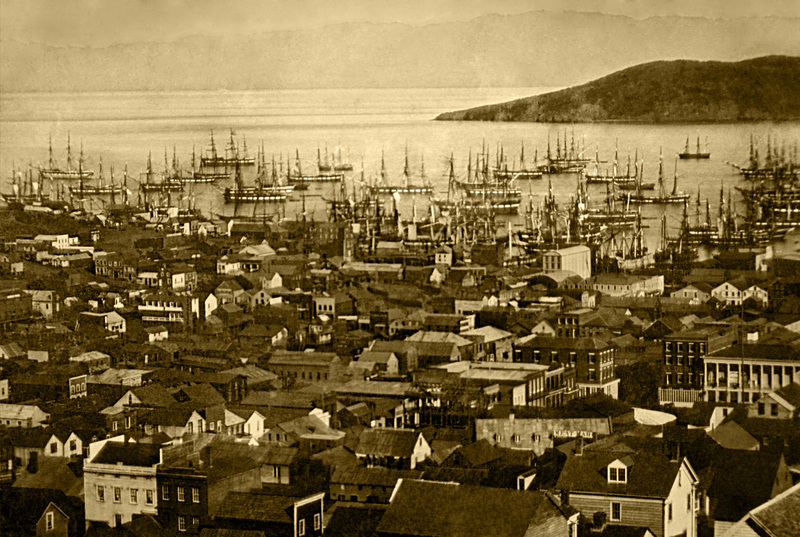 Then by the late 1850s, as many gold seekers returned to the east without riches, word spread that California also held out the possibility to future settlers of an alternative to the earlier west of trappers and soldiers and miners, a place where one could be successful in business and farming and enjoy an increasing number of urban amenities. Gold seekers continued to migrate to California, and highly capitalized corporations began to develop industrial processes to mine the gold that was hardest to reach. But the rush itself came to an end. Panning for gold. The earliest stage of the gold rush. Hydraulic mining and deep shaft mining came later and required large cash investment. (There are informative descriptions of the role of communication in the Gold Rush in the classic work by J.S. Holliday, The World Rushed In (1981), and David Dary, Red Blood and Black Ink ( 1998).